Aqua Wonder 2 is the name of the next high-end smartphone that Indian company Intex plans to launch in the next few weeks. According to NDTVGadgets, the smartphone is expected to hit shelves on April 15 and will be available for purchase at all major retailers across the country. Although Intex did not announce the phone’s official price tag, it stated that Aqua Wonder 2 wouldn’t cost more than Rs 10,000 outright, which is about $180 or €140. Intex Aqua Wonder 2 will ship with Android 4.1.1 Jelly Bean operating system out of the box and will be packed with popular applications and services, including Google Maps, Gmail, YouTube, WhatsApp Messenger, Nimbuzz and Facebook. Unfortunately, even though the hype around the upcoming Intex smartphone is pretty high, Aqua Wonder 2 is far from being impressive when it comes to hardware specs. However, given the fact that the smartphone will cost less than Rs 10,000, we could say it is a good alternative to more expensive brands. Intex Aqua Wonder 2 comes equipped with a 1.2 GHz quad-core Mediatek MT6589 processor, 512MB of RAM and 2GB of internal memory, which can be further expanded up to 32GB via microSD memory card. The phone sports a more than decent 4.5-inch IPS capacitive touchscreen display that supports 540 x 960 pixels resolution. 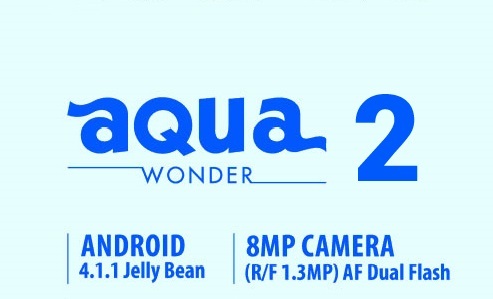 On the back, Aqua Wonder 2 boasts an enhanced 8-megapixel photo snapper with autofocus, dual LED flash and video recording. It also packs a secondary 1.3-megapixel front-facing camera for video calls and a 1800 mAh Li-Ion battery, which has yet to be rated by the manufacturer. Last but not least, Intex Aqua Wonder 2 offers dual-SIM capability, along with Wi-Fi and built-in GPS. In the same piece of news, Intex has confirmed that it will launch two more quad-core smartphones in India in the coming months, so stay tuned for more updates on the matter.